CEYLON, one of the most interesting islands in the world, is an important British Crown Colony. For sport, big game shooting, pleasure, and historic interest there are few places which surpass this delightful island. Whether the visitor has plenty of time at his disposal or has only a few hours while his ship is in port, Ceylon has much to offer that is unique. Colombo, the capital and chief port, lies on the west coast. There are in the fine harbour rarely fewer than two or three liners on their way to and from all parts of the world, and the tropical luxuriance of the town and suburbs makes a drive round in rickshaw or motor car a pleasure not easily forgotten. The Government-owned railways stretch over the greater part of the island, except the south-east coast; in the jungle districts they form practically the only available means of communication. There are 951 miles of railway, and of these 834 are broad gauge (5 ft 6-in) and 117 narrow gauge (2 ft 6-in). A PICTURESQUE SCENE on the South Coast Line of the Ceylon Government Railways. 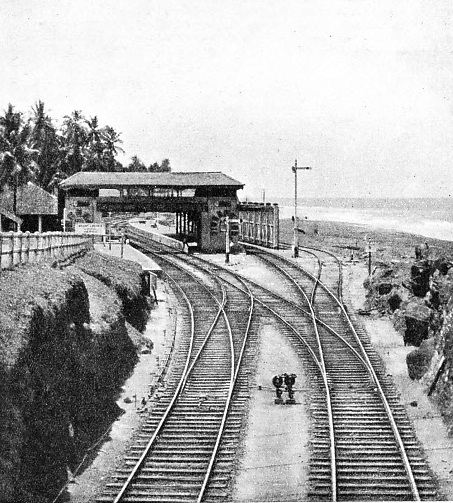 This photograph shows a section of the 5 ft 6-in gauge double-track line running through typical scenery near Mount Lavinia. The principal lines radiate from Colombo. These are the West Coast Line, running north along the coast to Puttalam; the Northern Line, via Polgahawela, Maho, and Madawachchi to Talaimannar; the Main Line, from Polgahawela to Peradeniya, Nanuoya, and Badulla; and the South Coast Line to Galle and Matara. From Madawachchi, on the Northern Line, a branch runs to Jaffna and Kankesanturai, on the north coast. From Maho the Eastern Line runs to Gal-Oya, where it forks, one section running to Trincomalee and the other to Batticaloa. From Peradeniya, on the Main Line, a branch runs via Kandy to Matale. The narrow-gauge sections are from Colombo to Yatiyantota and to Opanake, and from Nanuoya, on the Main Line, to Nuwara Eliya and Ragalla. The country traversed by the Coast and Northern Lines is fairly flat, but the Main and Eastern Lines have to cross ridges between the valleys of the rivers, while the lines above Rambukkana (on the Main Line east of Polgahawela) and in the upper reaches of the Kelaniya Valley have a series of sharp reverse curves between the hills and on the hillsides. The principal bridges are over the Pandura Lagoon, Kalu Ganga, and Bentota and Gin Ganga Rivers on the Coast Lines; over the Kelaniya and Maha Oya rivers on the Main Line; and over the Mahaweli Ganga and the Valaichchenai Estuary on the Eastern Line. Several short tunnels are encountered on the up-country Main Line. The rails are spiked direct to wooden sleepers, suitable local hardwood being used where available, but the majority of sleepers in use are of jarrah wood from Western Australia. The total number of broad- and narrow-gauge locomotives in service is 270. The principal classes are the 4-6-0 super-heater tank engines, while there is a “Garratt” locomotive working on the Kadugannawa Incline, on the Main Line between Polgahawela and Peradeniya. Running sheds with repair shops are located at the three divisional headquarters and at Nanuoya. In all there are twenty-seven running sheds on the system. The coaching stock consists of 921 carriages and thirty rail-cars, some of which are “Sentinels” and others petrol cars. Freight stock consists of nearly 4,000 wagons, most of which are of the covered type, and of 13 tons capacity; the bogie stock is of 37 tons capacity. The main locomotive, carriage, and wagon workshops were formerly situated at Maradana (Colombo), but they have now been transferred to Ratmalana, where some 3,000 men are employed. All stations on double-line sections are fully signalled and interlocked, points and signals being worked from the signal box in accordance with British practice, block working being on the lock and block system. Many of the principal stations are completely track-circuited between the outermost stop signals. The Main Line from Rambukkana to Peradeniya and the section thence to Kandy are also fully signalled and interlocked. The single line block working of the railway is by Tyers Tablet system. A through service is provided between Ceylon and India. Through trains run from Columbo to Talaimannar, whence ferry steamers convey passengers and goods over the twenty-two miles across Palk Strait to Dannshkodi, and thence to all parts of India. Palk Strait is almost bridged by a line of coral reefs and sandbanks known as Adam’s Bridge, partly utilized by the railway to Talaimannar. For travellers to India who elect to go overland from Colombo the journey of 323 miles through Ceylon is one of great interest. Comfortable modern carriages are provided on the trains, including refreshment and sleeping cars, the latter equipped with bedding - not a universal provision in this part of the world. The first place of importance on the Northern Line is Polgahawela, forty-five miles from Colombo. Here the line bifurcates, one portion (continuation of the Northern Line) going north to Maho Junction and the other (the Main Line) south-east to Peradeniya and the up-country section. A few miles farther on is Kurunegala, the administrative centre of the North-West Province of Ceylon. From Maho the Eastern Line branches off north-east to Trincomalee and to Batticaloa, two ports on the east coast. Some forty miles north of Maho is Anuradhapura, an ancient city of great historic interest which contains buildings erected 2,000 years ago, when it was at the zenith of its glory. The city is sacred to the Buddhists. At full moon every month hundreds of worshippers visit the shrines and temples. In June the annual “Poson” Festival is held, and thousands of pilgrims from all parts of Ceylon visit the city to pay homage to Buddha. Anuradhapura is 127 miles from Colombo, and is the headquarters of the northern division of the railway. In recent years the station goods depot and locomotive yard have been remodelled, and an island platform and modern offices have taken the place of the old platforms and buildings. There is also a separate pilgrim camp station, with sidings and connexions. The new locomotive yard includes a running shed, machine shop, coal stage, and carriage and wagon sidings. A few miles north of Anuradhapura is Madawachchi. Here connexion is made with trains tor the Jaffna Peninsula, the terminus of the line being Kankesanturai, situated at the most northerly point of Ceylon and 114 miles from Madawachchi. Jaffna is a large Government centre. In the town is an old Dutch fort, a relic of the days when not only Ceylon but also many parts of Southern India were under Dutch influence. The town carries on a brisk trade in tobacco, rice, and other products. The country around is peopled by Tamils, a hardworking and industrious race, but the arid nature of the soil makes cultivation extremely difficult. Kankesanturai is a health resort, with good sea-bathing. THE RAILWAY IN THE EAST. A view of Kandy Railway Station showing a familiar feature of the East, the rickshaws with their native runners. Special trains are often run to Kandy, the ancient capital of Ceylon, when thousands of people travel to see the religious festivals held there. The station lies on a branch line diverging from the Main Line at Peradeniya. The country north-west of Madawachchi consists of dense jungle, in which wild beasts may be seen in the glare of the engine headlights. Madhu Road is a lonely jungle station which wakes into life three times a year on the occasion of the Roman Catholic Festivals. 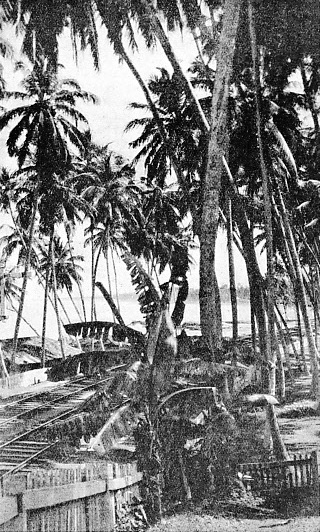 Twenty-two miles farther on is Mannar, a provincial Government centre, and seventeen miles beyond Mannar Talaimannar Pier is reached, where the train runs up alongside the boat. For the last part of the journey the railway runs along Adam’s Bridge, which appears as a dry sandy desert punctuated by solitary palm trees. From Maho Junction, eighty-five miles from Colombo on the Northern Line just described, the Eastern Line runs north-east to Gal-Oya, where it continues in the same direction to Trincomalee (183 miles), while another line runs south-east to Batticaloa. These sections were opened only a few years ago, and to both places the railway passes through dense jungle which effectually shuts off the view on either side. Trincomalee, a naval base, is situated on one of the largest natural harbours in the world, large enough to contain the whole of the British Navy. On the way from Gal-Oya Junction to Batticaloa is Polonnaruwa, an ancient city and former capital of Ceylon. It contains remains of temples, palaces, and monasteries, also a wonderful altar and figure of Buddha cut out of the solid rock. In recent years, through the excellent work of the Archaeological Survey, the city has been restored to view from the mass of ruins and jungle growth in which it was found. Beyond Polonnaruwa and about twenty miles from Batticaloa the railway emerges from the jungle, and passes through groves of coco-nut palms, from which copra, the staple product of the district, is obtained. Batticaloa is a small port and the distributing centre for the rice and coco-nut products of the district. The Main Line, forming the railway route to the hilly portion of Ceylon, branches at Polgahawela from the Northern Line to Talaimannar. The station at Polgahawela has two island platforms connected by footbridges, a goods shed, and a depot run by the Immigration Department for the resting and feeding of the coolies who arrive by the boat trains before distributing them to their various destinations. Soon after leaving Polgahawela the railway begins to climb the Kadugannawa Incline, which rises in a distance of twenty miles from 126 ft to 1,690 ft above sea-level, the ruling gradient being 1 in 44. Beyond Rambukkana the limiting curve is ten chains (660 ft) radius and above Nawalapitiya five chains (330 ft). The low speed up the incline affords the traveller an opportunity of seeing the gorgeous hill scenery to advantage. The railway track is cut out of the solid rock on the sides of the hills, and at times there is a sheer drop of 1,000 ft to the plains below, while the view, as the train climbs higher and higher, is continually changing. At the top of the incline is Kadugannawa Station, where the banking engines are stabled. Peradeniya is the junction for the line to Kandy and Matale. In the Botanical Gardens at Peradeniya may be seen growing nutmegs, cloves, pepper, cinnamon, and other spices. There are also in the gardens some wonderful avenues of palm trees, all exactly the same height. Kandy is the ancient capital of Ceylon. Built round an artificial lake, the town lies in a hollow surrounded by towering tree-covered hills. At the side of the lake stands the sacred Temple of the Tooth containing relics of the Buddha, including the sacred tooth, which is carried in procession at the religious festivals. Kandy, besides being the capital of the central province and an important Government centre, has a considerable trade in brass, silver, and lacquer ware. It has two good hotels and some modern shops. A “SENTINEL-CAMMELL” STEAM RAIL COACH operating on the 5 ft 6-in gauge lines of Ceylon. The seating capacity is fifty-eight third-class and eight first-class passengers. The weight of the coach, including seated passengers and baggage, is 32¾ tons, and its length is 56 ft. The diameter of the wheels is 2 ft 6-in. The six-cylinder engine has a designed output of 130 brake-horse-power. At Katugastota, the next place along the route to Matale, as many as thirty elephants may frequently be seen bathing after their day’s work, some being cleaned by their mahouts (keepers) and others enjoying themselves by rolling over and over in the water. Matale, the end of the branch line and seventeen miles from Kandy, produces rubber, cocoa, and tea in large quantities. The railway runs through groves of cocoa trees, the various coloured pods of which are strikingly picturesque. with factories, bungalows, and towns where tea planting is the staple industry. At Hatton, the next station, hundreds of pilgrims detrain to undertake the arduous climb of Adam’s Peak - the sacred mountain - on which is said to be a footprint of Buddha. From the summit (7,353 ft) at sunrise the shadow of the mountain can be seen on the clouds below, a phenomenon which induces many to pass the night at the top to await the rising sun. At the junction of Nanuoya the tea plantations end, to be succeeded by alternate thick jungle and open rice fields intersected by streams which furnish excellent trout fishing during the summer months. Nanuoya is the junction for the branch to Nuwara Eliya, to which in the months of March, April, and May all who can migrate from Colombo. Nuwara Eliya is reached by a narrow-gauge (2 ft 6-in) railway, with a ruling gradient of 1 in 26. This popular resort is situated 6,198 ft above sea-level, and its climate is the nearest approach to that of England, being cold, bracing, and healthy. Colombo’s humidity and uniformity temperature are very trying and make a stay in the hill country of great benefit to health. The social life of this beautiful place banishes boredom and monotony. Easter is the height of the season, and racing, golf and tennis tournaments, bridge, and dances provide recreation and amusement for the visitors. Nuwara Eliya is also a favourite residence for retired people, who find that money goes farther here than in the capital, or at any rate procures more comfort and more social life. The branch line ends at Ragalla. Returning to the broad-gauge line, the summit level is reached at Pattipola, in the heart of the jungle. Beyond the summit tunnel the jungle gives place to open country, with hills and valleys dotted with numerous villages. When the train is passing Haputale Station an extensive view across the low country to the south coast may be obtained, and on a fine night the lights of ships passing fifty or sixty miles away can be distinguished. 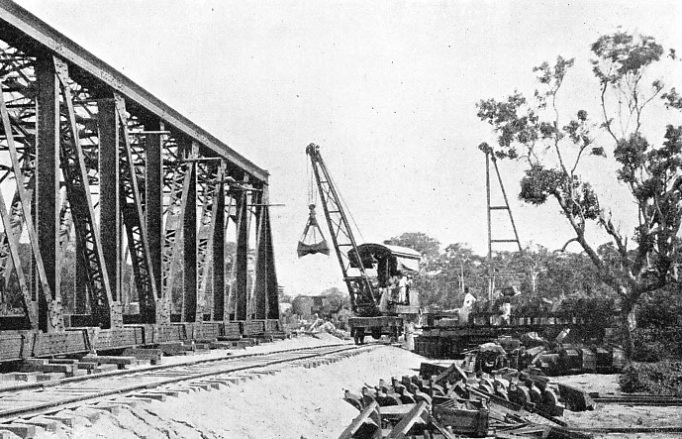 BUILDING THE DEDURU OYA BRIDGE on the line to Puttalam. The West Coast Line runs north to Puttalam from Colombo, along the West Coast of Ceylon. The Deduru Oya Bridge has five spans each of 150 ft.
At Diyatalawa are rest camps for men of the Army and Navy, and Bandarawela is another of Ceylon’s health resorts, to which dwellers of Colombo flock during the hot season. Twenty-four miles farther, and still on a falling gradient, the railway reaches Badulla, the terminus and the capital of the province of Uva, where more tea plantations are to be found. The Kelaniya Valley Railway serves a large rubber-growing district. As the traveller passes through the district by train he will see from time to time plantations of tall trees with slanting cuts across the bark near the base, from which exudes a white milky fluid. These are rubber plantations, basis of another great industry of Ceylon. The rubber tree, which attains an average height of eighty feet, flourishes best in a humid tropical climate where the rainfall averages from 150 to 175-in per annum and at elevations from sea-level to 1,000 feet. Land that has been virgin jungle is, when cleared, the type most suitable for planting purposes. The South Coast Line is double to Kalutara, and the first important station from Colombo Fort is Slave Island, which is close to the ice and cold storage factories. Up and down platforms connected by an overhead bridge are provided. Farther down the line is Mount Lavinia, a popular seaside resort where excellent bathing is obtainable. Moratuwa, the first combined passenger and freight station, is a watering station, situated thirteen miles from Maradana. Beyond, the railway runs through groves of coco-nut palms to Galle, the capital of the Southern Province and noted for its tortoiseshell ware. Matara, ninety-nine miles from Colombo, is the present terminus of the South Coast Line, but it is proposed to extend the railway to Tangalla, farther along the coast. Both Galle and Matara were formerly Dutch, and at the former remains of the old fort and city are still standing. The central station at Colombo is Colombo Fort, which deals with passengers and parcels only. There are several platforms and the usual public facilities are provided at platform level. The platforms, which are all roofed, are connected by a foot-bridge at either end. Maradana Station, the junction for the Northern and West Coast lines, is situated between the locomotive running shed and the Colombo main wagon depot. The station building consists of two wings connected by an overhead bridge. Colombo Goods Station is the chief receiving station for freight traffic and consists of two outward and three inward warehouses and two sheds for the storage of tea chests and fibre respectively. There are also direct delivery sidings, one being at the lake front, where goods are delivered direct into barges. Other sidings are for delivery of bricks, fibre, and other goods. The goods sheds are in charge of a goods agent, with the assistance of warehousemen and a large staff of clerks, checkers, and policemen. The traffic handled yearly is over 300,000 tons, both inwards and outwards. Colombo Port and Wharf are freight stations situated in the harbour area in the Port Commission premises and deal with import and export traffic. The allocation and dispatch of wagons are in charge of a “Trains and Goods Officer” under the harbour engineer, while loading, freighting, and accounting are performed by officers and checkers of the Transportation Department. The business quarter of Colombo is known as the “Fort”, in which abound native shops containing jewellery, silks, and curios for the enticement of tourists. The real Colombo, however, does not lie there any more than it lies in the great hotels, but in the native quarter, or “Pettah”. Here, in narrow teeming streets in which the shops open from the pavement and strange odours fill the air, white-clad people hurry to and fro. 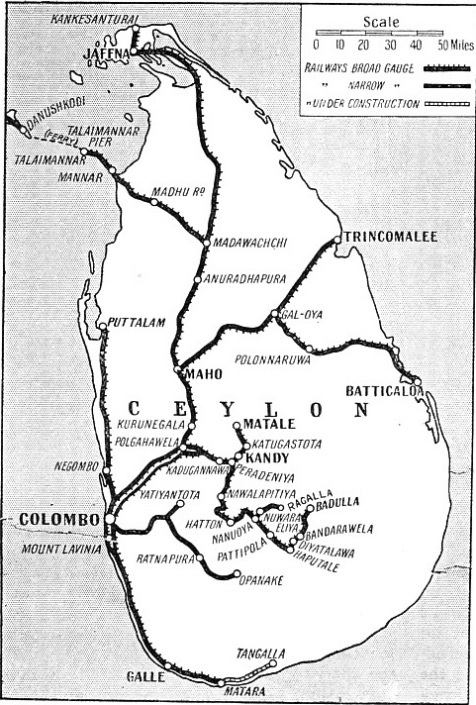 A BRANCH LINE IN CEYLON. Kala Oya Bridge, a substantial structure on the line to Trincomalee and Batticaloa. The ports of Trincomalee and Batticaloa are linked up with the main railway system by the Eastern Line, which leaves the Northern Line at Maho Junction. Leading from the Fort to the outer part of the town is the renowned Galle Face Drive, running for a distance of a mile along the edge of the sea. The suburbs of Colombo stretch far out amid magnificent avenues of giant trees. The district known as Cinnamon Gardens, formerly covered with groves of cinnamon, is about three miles from the town, and is a favourite residential quarter, with pink or white-washed bungalows of unusual appearance. Coco-nut groves are everywhere, and flaming bougainvillaea and poinsettia add vivid touches of colour to the landscape. A large volume of suburban traffic is handled within a twenty-five miles radius of Colombo. The trains are used chiefly by the clerical staff employed in Government and mercantile offices, and by a large number of workmen. Suburban traffic is heavy on the coast-line between Colombo and Mount Lavinia, the distance of about nine miles containing five stations. On the narrow-gauge line there is an intensive traffic up to Nugegoda, a distance of five and a half miles. On the Northern Line up to Ragama, nine miles, and on the West Coast Line up to Jaela, thirteen miles, suburban traffic also is very heavy. The peak periods of the rush into Colombo are between 7.30 and 9.30am, and out of Colombo from 4.30pm to 5.30pm. To deal with this traffic local suburban trains on the coast-line are run at intervals varying from five to fifteen minutes, terminals being Mount Lavinia and Moratuwa. On the Northern Line suburban trains are run out as far as Ragama, Gampaha, Veyangoda, and reversed at these points. The religious festivals are a great feature of Ceylon railway traffic. The seven days in June during which the “Poson” Festival at Anuradhapura lasts tax the resources of the railway to the utmost, as many as 50,000 pilgrims travelling by rail on this occasion. For the Roman Catholic Festival at Madhu fully as many pilgrims may travel by the railway to Madhu Road. There are also the Harvest Festival at Kandy early in the year, and the “Esala Perahera” in August, the latter lasting thirteen days and drawing thousands of pilgrims from all parts of Ceylon. The Kandy Festival of the New Rice (“Alutsal Perahera”) takes place on the full moon day in January each year. In the temple village of Gurudeniya, a short distance away, where rice crops are raised, the tenants of the Dalada Maligawa (Temple of the Tooth) have to set apart each year a portion of the harvest as an offering to the sacred Temple of the Tooth and other shrines in Kandy. This was an order of a former king of Kandy when granting the land, and has been obeyed for centuries. The procession of elephants, tom-tom drummers, oboe players, temple officials, and servitors proceeds to Kandy, where the distribution of the “Alutsal” or new rice is made. The dancers in the procession are dressed in every imaginable costume, and perform marvellous evolutions while the playing of the oboe, the drumming of the tom-toms, and the banging of the kettledrums create an unearthly din. Many thousands of people come to Kandy to see the festival, and special trains are run to accommodate them. The “Esala Perahera” in August draws an even greater number of people, and the whole town rejoices for several days. Several other religious festivals require special train arrangements, but not on such an extensive scale. Standard Sinhalese express locomotives are of the 4-6-0 type, as stated earlier in this chapter. They have a peculiarity in that they are fitted with side tanks in addition to their tenders, giving them a high water capacity and an increased adhesion weight. Cowcatchers are invariably fitted, as the forests of Ceylon contain all manner of wild animals, and powerful headlights are mounted in front of the chimneys. MOUNT LAVINIA STATION in south-west Ceylon. There is heavy suburban traffic on the coast line between Colombo, the capital, and Mount Lavinia. There are five stations on the nine miles stretch between the two towns. The trains are used chiefly by the clerical staff in Government and mercantile offices, and by labourers. The predecessors of these engines, from the earliest days until comparatively recently, were of the 4-4-0 type with outside cylinders, in appearance slightly reminiscent of those belonging to the North Eastern Railway in the ’seventies of the last century. For years these locomotives worked express trains on the level sea-coast section between Colombo and Galle. Sinhalese passenger coaches are a curious mixture of Eastern and Western practice. Their general arrangement resembles that of British passenger stock, but they naturally have to be provided with sun-shades to the windows, and various other devices for minimizing the effect of the fierce sun. Recently the Ceylon Government Railways have had some 880hp Diesel-electric locomotives built for hauling the broad gauge “Indian Mail” expresses. They are of the 1-CO-1 type; that is to say, they each have six uncoupled driving wheels with independent drive, and two carrying wheels at either end. They have been built on the Tyneside by Sir W. G. Armstrong, Whitworth & Co. (Engineers), Ltd.
You can read more “Burma’s Metre Gauge System”, “Island Railways” and “Modern Transport in India” on on this website.